Magnetic balls provide exciting avenues for exploring many fundamental phenomena in physics. They can be assembled by hand into chains and more complex structures and used to model the properties of unstretchable materials that, like paper, crumple under certain loading conditions. Magnetic balls stacked on top of each other into vertical chains remain stable, but only for certain choices of salient parameters. 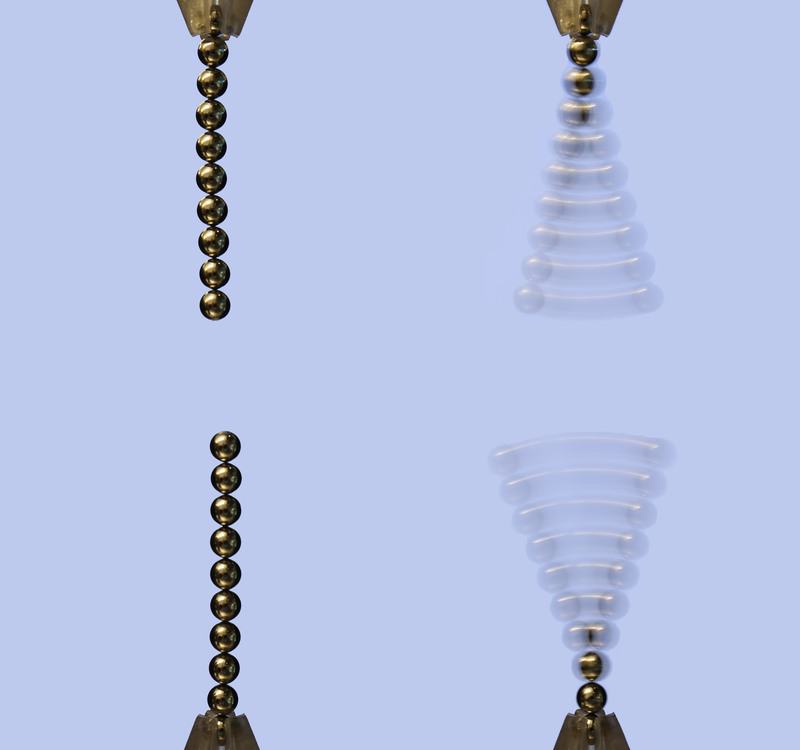 Professor Eliot Fried and Dr. Johannes Schönke from the Okinawa Institute of Science and Technology Graduate University (OIST) examined the maximum length of a chain of magnetic balls that can be balanced vertically without toppling – a simple but important phenomenon related to the stability of magnetic chains. Using theory and mathematical analysis in combination with experimental data, they determined the critical parameter values at which chains lose stability under various circumstances. The findings, published in Proceedings of the Royal Society of London Series A, could provide insight into the stability of unstretchable materials used in large-scale architectural design. This has many practical applications in construction, from concrete power plant chimneys to the outer shells of rocket ships. Professor Eliot Fried and Dr. Johannes Schönke from OIST’s Mathematical Soft Matter Unit. First, they considered a single chain fixed at its base made from 5mm diameter magnetic balls, each weighing 0.5 grams and having a magnetic flux density of 1.19 Tesla (T). A chain of nine balls remains stable, but a chain of 10 balls buckles under its own weight. Next, the team looked at the case of two chains, one being attached to the ground and the other hanging above with a gap of prescribed length in between. When the magnetic fields were aligned such that the upper chain and lower chain were magnetically attracted to each other, the upper chain stabilized a lower chain of 10 balls in length. In other words, the presence of an upper magnetic chain increases the length at which a chain clamped at its base remains stable. Pairs of fixed chains with a gap of prescribed length in between, at rest (left) and in oscillatory motion (right). “As the number of magnetic balls in the lower chain increases, the gap between the upper and lower chains needs to be narrowed for the lower chain to remain stable,” explains Dr. Schönke. Even if the bottom chain is unfixed, the magnetic interaction with the upper chain provides stability – an impossible scenario for a single unfixed chain. However, in this case, if the distance between the upper and lower chains is too small, the unfixed bottom chain lifts off and attaches to the upper chain. In the final experimental setup, the researchers reversed the orientation of the magnetic balls in the upper chain so that the direction of the magnetic field of the upper chain opposed that of the fixed lower chain. Due to the resulting repulsion force between the two chains, the lower chain only remains stable with eight balls, one ball fewer than a stable single fixed chain and two balls fewer than a stable fixed lower chain attracted to a suspended upper chain. “We found that the stability of magnetic chains is determined by the number of balls in a chain, the size of the gap between the upper and lower chain, and the strength of the magnetic forces relative to gravity,” says Professor Fried, who heads OIST’s Mathematical Soft Matter Unit. “It may seem like a bit of fun with toy magnets, but in fact, we have performed nontrivial mathematical calculations that allow us to explain the stability of magnetic chains with extreme precision,” says Dr. Schönke. These findings provide a basis upon which to study more complex structures of magnetic balls, such as cylindrical tubes comprised of stacked circular rings. If the rings are square packed such that each ball is in contact with only its four immediate neighbors, it can be deformed in many ways. 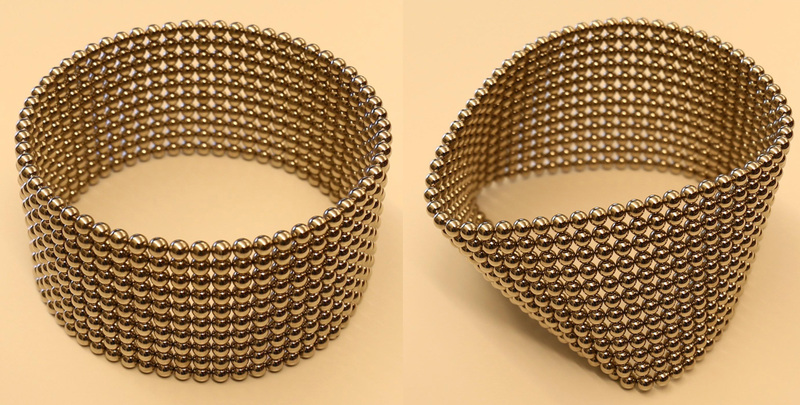 Stability of cylindrical tubes made from 60 square packed magnetic balls of diameter 5mm, mass 0.5g and magnetic flux density 1.19 T. While a stack of 10 rings is stable, a stack of 12 rings collapses under the influence of gravity. Compared to square packed rings, hexagonally packed rings in which each ball is in contact with its six neighbors, are more stable. Maintaining the connections between the balls in this way creates a system that is incapable of extension or contraction. As such, structures configured in this way provide a model for understanding unstretchable materials like paper. This diagram shows square packed (left) and hexagonally packed (right) magnetic balls. Square packed balls are in contact with four other balls, while hexagonally packed balls are in contact with six. As many unstretchable materials are used in construction, working out the parameters under which these model structures are stable or unstable is of huge importance. “One of the next steps is to conduct more dynamic simulations using cylindrical tubes of magnetic balls and determine the critical parameter values at which structures configured in this way lose stability,” says Dr. Schönke.